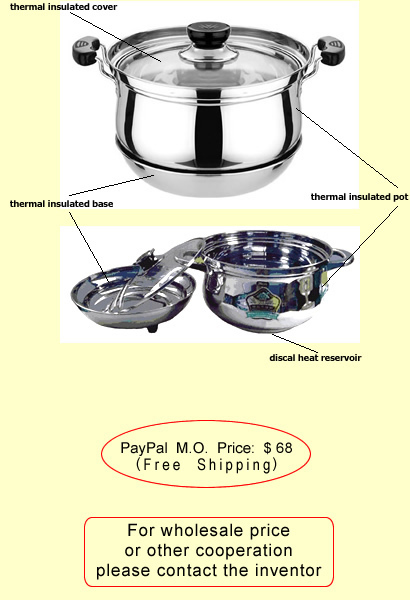 ﻿ OFR Pot (off fire reboiling pot) | The Energy Saving Pot - Save Money! Save Gas! Green! LOHAS! Money saving, Energy conservation and green environmental protection are so closely related to our lives that we are obliged to pay much attention to them. The concept of "off fire reboiling", a concept concerning the modern eco-friendly cooking utensil , was born in 1987. Ordinary cooking utensils are energy-wasteful, especially stewing pots. During preparation of foods such as rice, porridge, meat, soup or vegetables, the content of the pot is usually heated to boiling point and then allowed to stew or simmer on the stove for a considerably long time, using up fuel to do so. However, once boiling temperature is reached, the temperature within the pot does not actually rise beyond that. Instead, the energy wasted is used just to offset the heat lost (through evaporation, conduction, convection) in order to maintain the cooking pot at a sufficiently high temperature. In fact the pot can be kept boiling without using heat energy if there is no such heat loss! Why not create a heat insulated pot that can reboil without consuming more heat energy? Based upon the above observed fact, Zhiliang Wan(万之樑), the inventor of "off fire reboiling pots", made two inventions and applied for two patents during 1986-1988, one of which was named 《daily thermal insulated energy-saving cooking utensils》(patent number: CN86207669), the other was named 《utility energy-saving timesaving regenerative and thermal insulated cooking utensils》(patent number: CN1042062). Both patents are now public free technologies except unpublished part, the specifications can be searched out (by patent numbers) and read in detail (in Chinese language) on the website of The State Intellectual Property Office Of P.R.C. The information also can be found out by Google search. In the patent of 《daily thermal insulated energy-saving cooking utensils》, Zhiliang Wan propounded for the first time the concept of "thermal insulated energy saving heating utensil" and its overall design -- a thermal insulating envelope to be added outside the body of the pot. The "thermal insulated stewing pots" made in Japan, Taiwan and the mainland of China since the late 1990s are fundamentally in accordance with the specification of this patent. In the patent of 《utility energy-saving timesaving regenerative and thermal insulated cooking utensils》, Zhiliang Wan further propounded the creative concept and implementary plan of "heat conservation and thermal insulation → off fire reboiling". The significant innovation in this patent lay in: On the basis of adding a thermal insulating envelope outside the body of the conventional pot, a disc-shaped heat reservoir is installed beneath the metal base of the thermally insulated pot. The heat reservoir conserved heat energy during the heating process on the stove and resupplied heat energy for the pot to make up for the slight heat loss and keep it continuously reboiling after it being taken off the cooking stove. The current popular "off fire reboiling pots" are fundamentally in accordance with the specification of this patent. Today the "off fire reboiling pots", "self-reboiling pots" and "fire-free reboiling pots" on the market are various in brands, types, and processing techniques, they are all built on the same core concept elucidated in the above-mentioned two patents. There is almost no heat loss and 35-55% of heat energy can be saved by using this sort of cooking utensil. "The present invention's aim is achieved by the following method: Beneath the metal bottom of the "daily thermal insulated energy-saving cooking utensil", a disc-shaped heat reservoir is installed, which is made of a special refractory material with excellent heat storage performance. When the utensil is placed on the stove being heated, the disc-shaped heat reservoir located beneath the utensil's bottom is heated up and starts to store heat energy, as the food in the utensil is heated up to boiling point, the heat reservoir has already stored a significant quantity of heat energy. Now the utensil can be taken away from the cooking stove and put on the thermal insulated base, the heat reservoir beneath the utensil's bottom will release its stored heat energy slowly. In the first tens of minutes, the pot can be maintained at boiling point temperature, while afterwards it can be maintained above 85℃ for several hours. The fact proved: If we want our food to be thoroughly cooked by stewing, we needn't keep it continuously ebullient on the stove, but just keep it under a certain high temperature close to 100? and let it go through a period of time. Therefore, by means of the above-mentioned design, this invention has achieved its aim through successfully appending the heat-regenerative performance to the "daily thermal insulated energy-saving cooking utensil" and thus making it has the special function to continuously heat up and turn raw or deficiently cooked food into thoroughly cooked food after the cooking utensil has been taken off from the cooking stove. " * Because the pot can be taken off from the cookstove as soon as it reaches boiling point, and there is almost no heat loss throughout the whole stewing process, 35-55% of heat energy can be saved. It is especially suitable for stewing rice, porridge, meat, soups, vegetables, etc. Furthermore, by taking advantage of the pot's excellent performance of thermal insulation, every morning before your going to work you may just heat your meat or soup to boiling point and then let the utensil itself simmer the food for you, you'll be happy to enjoy the warm and thoroughly cooked meat or soup when you come back home from work in the evening. All this is fulfilled without any energy costs! Copyright© 2018, ZhiLiang Wan, All Rights Reserved.